WifiBuilder is the industry’s first diagnostic and production Wi-Fi access point. 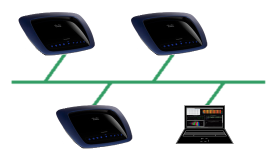 A new type of wireless network tool that excels at determining your wireless network’s best channel. WifiBuilder is both a diagnostic tool AND a high-end, dual-band, 802.11N access point. Use it in diagnostic mode for troubleshooting and detecting RF interference that cripples the performance of your Wi-Fi network (using IMMI technology it computes which channel has the greatest available bandwidth). Or use it in production mode, configure the WifiBuilder access point to use the best channel for optimal performance and leave it in place — for use as your normal AP. When troubleshooting an 802.11 network it is not possible to predict how it will behave when you are armed solely with RF measurements. This is why we focus on performance metrics and IMMI (Indirect Measurement of Microwave Interference) technology — because they more accurately predict how your wireless network will actually perform. 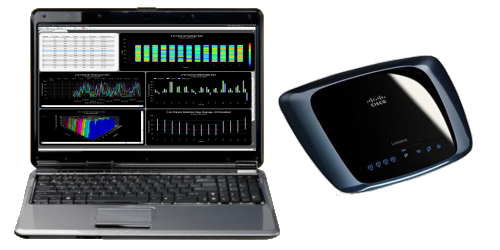 Though RF spectrum analysis remains a popular tool for troubleshooting interference-related problems, IMMI technology holds greater promise since it excels at computing the best Wi-Fi channel — that is, the channel with the greatest available bandwidth and least affected by RF interference from other wireless devices. IMMI technology employs 802.11 hardware and sees the RF environment through the same eyes as the wireless devices in your network. PC Magazine announces that WifiBuilder has won the seventh annual PCMag.com Best of the Year 2011 Award in the category of Network Software. WifiBuilder received a great review from PC Magazine — 4.5 stars and an Editor’s Choice award. The WifiBuilder AP runs a customized version of Linux that supports diagnostic applications that are run from your PC. Until now Wi-Fi diagnostic tools have come in the form of handheld, PC-based USB or PCMCIA, or luggable RF analyzers. WifiBuilder is different — it goes straight to the source. It uses a high-end, dual-band, 802.11N access point for data collection and provides a view into your local RF environment that no other tool can provide. 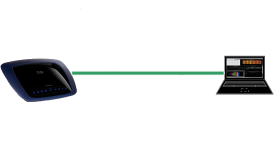 Data collected by the WifiBuilder AP is used by our diagnostic software to troubleshoot performance problems and configure access points for optimal bandwidth and channel usage. The same WifiBuilder AP that is used for troubleshooting problems and performing diagnostics can also be used as your production AP for normal 802.11 network connectivity. To compute the best channel for your Wi-Fi network — that is, the channel with the greatest available bandwidth — thereby improving performance of your wireless computer network. To be used at the enterprise level, in small businesses and at home. To be used as a standalone diagnostic tool or as a production AP — integrated as part of your Wi-Fi network. The WifiBuilder AP supports diagnostic applications that are run from your Windows desktop or laptop machine. These diagnostic applications are used for installing, troubleshooting and monitoring 802.11 wireless networks. That is, in addition to being used as your normal AP for wireless network communication, WifiBuilder is designed to be used as a diagnostic tool — performing data acquisition and communicating with a Windows application that analyzes the results and displays them using graphical charts. When the WifiBuilder AP is left in-place as your normal AP then its diagnostic capabilities are always available when the need arises. Alternatively, the WifiBuilder AP can also be used as a mobile diagnostic tool — just connect it to your PC via ethernet cable and to a power outlet (using the AC adapter that is included with the product). Included with WifiBuilder is a configuration tool — Figaro — that allows you to easily change the SSID, channel and security settings when using the WifiBuilder AP in production mode.